You've dreamed of it for years, and now you're ready to do it – you're going to start your own business. But you'll have to take care of a few things first. You'll probably want to register your business name, and in some cases and depending on your business's legal business, this may be a requirement. You'll have to register with your state to pay taxes, and you may have to obtain licenses and permits. Contact the Virginia Department of Professional and Occupational Regulation at 804-367-8500 about licensing requirements. Virginia doesn't have one blanket license that pertains to all businesses – it depends on the service or product you're offering. Some examples of businesses that require licensing include barber shops, real estate agents, and engineers. This number will identify your business with the Internal Revenue Service. You'll need one to pay federal taxes, to open business bank accounts or to pay employees. You can usually skip this step, however, if you're a sole proprietor and don't have employees. In this case, you would conduct business under your own Social Security number. You can apply for an EIN online for free at the IRS website. 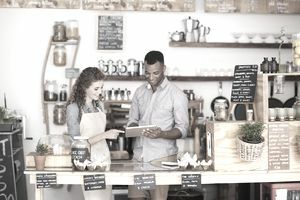 Virginia offers a Business Registration Guide that includes a great deal of helpful information from the State Corporation Commission for various business entities. Most businesses can take care of registration online as well. Start with an online search to make sure your business name isn't already taken, then the website will walk you through the additional steps in most cases as long as your business structure isn't complicated. Almost all businesses must file a Virginia corporate income tax return if they're incorporated under Virginia law, have registered with the State Corporation Commission for the privilege of conducting business in Virginia, or receive income from Virginia sources. Federally tax-exempt nonprofit organizations only have to file corporate income tax returns if they earned unrelated business taxable income at the federal level. Virginia allows businesses to file returns and pay withholding and sales taxes online, as well as file and pay corporate extensions, send secure messages, pay tax bills and register for nonprofit exemptions. If you select S corporation status for your federal tax return, you are also automatically considered an S corporation in Virginia. The Virginia District Office of the Small Business Administration Center is located in the Federal Building at 400 North 8th Street, Suite 1150, Richmond, VA 23219-4829. You can phone 804-771-2400 with questions or for further information. The fax number is 804-772-2764 or you can send an email to richmond.va@sba.gov. This office covers all of Virginia except Arlington, Fairfax and Loudoun counties, and the cities of Alexandria, Fairfax, and Falls Church. The SBA can give you contact information for these areas. The Virginia Guide to Establishing a Business can also be helpful. It summarizes the major state and local tax, labor, occupational and environmental regulations that may affect various businesses in Virginia.